Direction: Read the following passage carefully and answer the questions in English. You have 20 minutes to write your summary. Address all prompts in paragraph format using complete sentences. 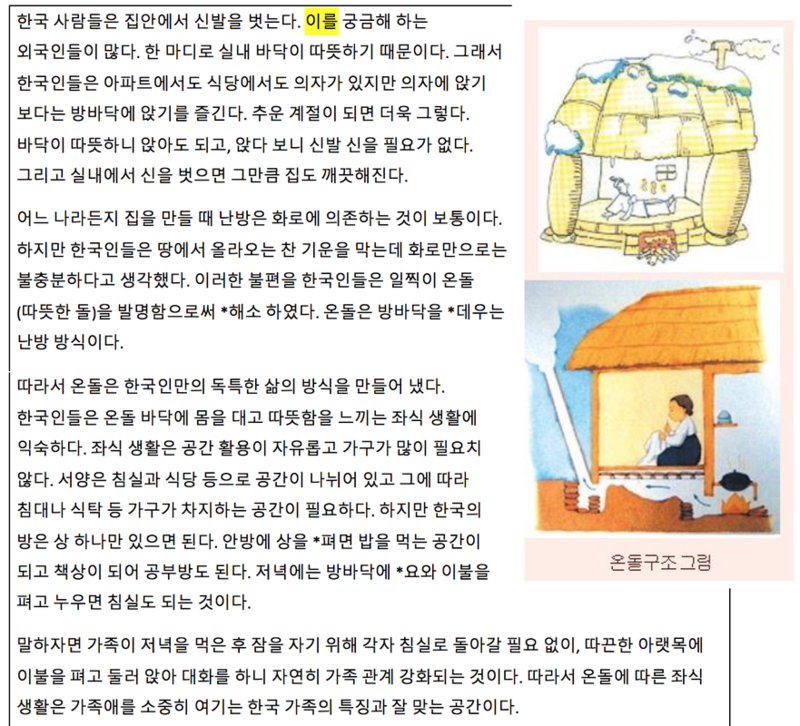 Item 1: Summarize the article in English. Address all 3 of the following prompts. Item 2: Underline what the highlighted pronoun “이를” is referring to in the text. Scoring Notes: Summary does not have to use the same wording as the protocol. Award credit if student wording accurately conveys the meaning of the original text. A-Idea 1: It is because the floor is warm. C-Idea 1: It helps to keep the house clean. C-Idea 3: It does not need much furniture. C-Idea 4: It enhances family conversation. C-Idea 5: It strengthens family relationships. Idea 1: Korean people take off their shoes at home. Item 1- a objective: Students must interpret the speaker’s intention. Item 1-b objective: Students must identify an explicitly stated cultural traits as a result of Koreans using “on dol”. Item 1-c objective: Students must determine which portion of the passage provides evidence to the use of “on dol”. Item 2 objective: Students must determine the antecedent of the pronoun in context. Grammar: Using the past tense with Korean connector 아서/어서/여서. This grammar structure means: as, because, so, since. Lesson objectives: Students will review the past tense and be able to use it in a compound sentence using connector 아서/어서/여서. Students will understand connector 아서/어서/여서, which does not take the “았/었/였” past tense morpheme. Directions: Your teacher will read a short story twice. When you listen for the first time, do not take notes; just focus on the overall meaning. When you listen for the second time, take brief notes. Do not try to write every single word or sentence. Focus on meaning. Afterwards you will be working with a partner to reconstruct the story based on the notes you and your partner took. You will have a total of 20 minutes to complete this task. You will have an opportunity to compare your reconstruction with the original text at the end. Grading: Students’ work will not be graded. I will use this as a classroom diagnostic assessment. Text is adapted from a diary. 오늘은 사진첩에서 오래된 사진 한 장을 찾았다. 사진 속의 친구들은 웃고 있다. 영수는 키가 아주 컸다. 친절해서 다른 친구들도 모두 영수를 좋아했다. 진수는 뚱뚱하고 다리가 짧았다. 친구들과 싸움을 잘 해서 모두 싫어했다. 유미는 얼굴이 둥글고 마음이 착했다. 유미의 동생 유선이는 손가락이 길어서 피아노를 잘 쳤다. 내 옆에 강아지가 있다. 이름은 복덩이였고 털이 아주 많았다. 사진 속의 친구들은 지금 어디에 있을까? 보고 싶다. 친구야. *Audio is unable to upload. 1. 숫자 33, 177, 64는 각각 무엇을 의미합니까? What do numbers 33, 177 and 64 mean? a. 이름, 나이, 직업 name, age, occupation They are his name, age and occupation. b. 나이, 직업, 키 age, occupation, height They are his occupation, height and age. c. 직업, 키, 체중 occupation, height, weight They are his occupation, height, weight. d. 나이, 키, 체중 age, height, weight They are his age, height, weight. 2. 2008년 입사한 회사를 퇴사한 후 강성찬씨는 무엇을 했습니까? What did Mr. Kang do after he left the company? a. 국내여행 domestic travel He traveled Korea. b. 해외여행 international travel He traveled abroad. c. 졸업여행 graduation trip He studied in France. d. 계절여행 seasonal travel He went to America. 3. 강성찬씨는 파산 후 무엇을 했습니까? What did Mr. Kang do after he filed for bankruptcy? a. 휴식 He rested for 2 years. b. 책 출판 He published a book. c. 퇴사 He resigned from his position. d. 귀국 He became a homeless person. 4. Which statement do you think best describes Mr. Kang’s characteristic? What three things do Koreans consider the most when seeking employment? How do these affect Korean society? Based on the listening and reading passages, discuss problems in the Korean labor market and provide your suggestions to the problems. 2. Read a passage about employment. 3. Your essay will be graded based on the rubric. Use the rubric as a guide when writing your essay.